Forest Green Rovers have signed defender David Pipe on a free transfer following his release by League Two Newport County. Pipe left his hometown club by mutual consent in April, after being told his deal would not be renewed this summer. He has signed a two-year contract at the New Lawn. 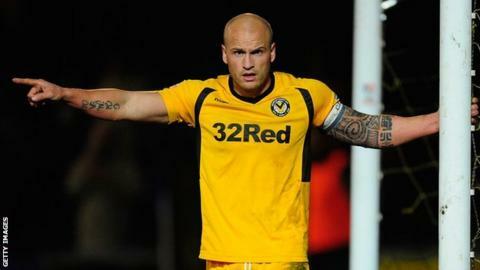 The 30-year-old, who played once for Wales, was captain at Newport when they won promotion to the Football League in the 2012-13 season. He previously had spells at Coventry, Notts County, Bristol Rovers and Cheltenham Town. "I want a club with ambition," Pipe told BBC Gloucestershire. "I've played here in the past and understand the professional level they work at. "The way the manager operates and the things I've seen here since I've been here are very good."